“grammar” is not a simple, unified subject. Rather, it is a cover term for at least four different, and sometimes mutually exclusive, conceptions of grammar: prescriptive, descriptive, generative, and contextual. My university training as a linguist means I studied the latter three types of grammar rules. (I learned the prescriptive type in elementary school.) My role as a writing teacher means I often interact with people who assume I share the worldview of prescriptive grammar — that language can be wrong. I don’t. Let me explain why not, borrowing from Parker and Riley’s chapter 2 on the prescriptive period. Prescriptive grammar is the result of a movement in England between 1650 and 1800. Influenced by the chaotic political and social climate of the time, four literary giants (Dryden, Defoe, Swift & Johnson) tried to control the English language by forming a regulatory agency. Although the agency did not endure, Johnson’s authoritative dictionary did. And so did the men’s haughty conviction that breaking the rules for proper English (as arbitrarily defined by them) constitutes a breach in etiquette and is therefore wrong. (You know, like wearing white shoes after Labor Day.) Sadly, even highly educated people don’t know the history behind these vapid rules. Keep a preposition with its object. The rule apparently is based on the fact that in Latin (as in all Romance languages), prepositions always precede a noun phrase and thus never appear in sentence-final position. So, you should ask, what is the relevance of Latin as a model for English? Well . . . there is no direct line of development from Latin to English. Rather English evolved from Germanic roots. 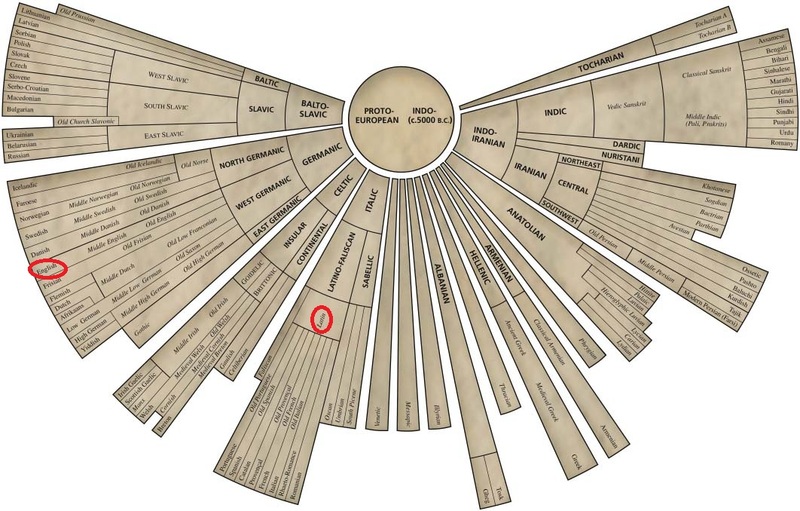 (I’ve added red circles to the diagram from the 4th edition of The American Heritage Dictionary of the English Language.) Also, English is structurally different from Latin, using few inflections and a basic verb-object order. Too, by Lowth’s time, Latin had been a dead language for more than a milleneum. (No one outside of a monastery spoke it after 700 AD.) The fact that a dead language doesn’t change, while a living one cannot stop changing was apparently lost on Lowth and his prescriptivist pals. You should also definitely ask: what were Lowth’s credentials for creating rules for English usage? 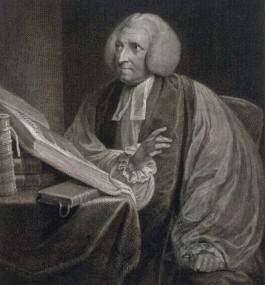 He served as Bishop of Oxford and was a professor of Hebrew poetry (in other words, The Old Testament). I willingly recognize Lowth’s expertise in reading Hebrew and Latin. He might also have been a good writer. (I can’t judge the performance of 18th century British scholars.) But I won’t grant him expertise over the English language I use today. His rule about preposition placement convinces me he had little enough understanding of the language used during his own lifetime. Language has always helped to signify who we are in society, sometimes serving as a basis for exclusion. A Bible story tells how a password, shibboleth, was chosen because the enemy didn’t use the sh sound.“Shibboleth” has since come to signify an emblem of belief or membership, an identifiable sign of those who must stay outside the gate. If my students’ language signals they may not pass inside the gate where professionals reside, I never tell them they’re wrong. I do sometimes tell them their language will elicit negative attention from more than a few workplace readers. But only when they break prescriptive grammar “rules” that count as shibboleths for professional membership. It’s my responsibility to know which rules matter. Because of my studies in writing and business communication, I know ending a sentence with a preposition isn’t one of them. There has been considerable research in this area over the past 30 years. In a professional writing course, I always explain levels of formality (see my The Video Tutorial on Word Choice) to everyone. I explain grammatical shibboleths to individual students whose usage signals they belong outside the gate: double negatives and subject-verb agreement are the prime examples. I also explain a few other mechanical issues that serve as shibboleths: sentence fragments, comma splices, and misspellings as needed (see The Video Tutorial on Punctuation). What is most sad to me is that so-called language experts (that means most English teachers, who study little, if anything, about language) perpetuate the worldview of your-language-is-wrong with a total lack of awareness. Almost every person I know believes language can be wrong. Many of them are highly educated — even with English degrees. But they were denied any real language education. They did not learn that English does not belong to those long-dead, reactionary, literary men of the 18th century with little understanding of language. To me, there is a critical difference between telling students their language is wrong and telling them their language is likely to be unsuccessful because it will distract their readers and undermine their credibility. As an educator, I believe my job is to expand rather than restrict my students’ choices. (I’ve advised folks to avoid anyone who wants to restrict linguistic choices before.) I don’t have to promote the use of shibboleths to teach students how to enter their chosen professions. That’s why I liked Stephen Fry’s essay about language. He recognizes that each of us owns our language. And that context is everything. Excellent post! I liken this to the notion that we are not teaching students “what” to think, but “how” to think. Word choice is just that. .. a behavior choice that communicates a certain message. And education is about increasing students’ awareness of the potential outcomes of certain, logic, behavior, etc. It is not about the prescription of one behavior over the other. We are definitely “sympatico,” Chas. Makes it easy to love ya! I totally agree with your view on ‘wrong’ grammar or usage. I won’t say your view is ‘right’ – just that it’s the same as mine, and I like how you expressed it. In my work (editing, document reviewing, training, coaching) as a corporate plain-English consultant, I always stress that there’s no such thing as ‘right’ or ‘wrong’, ‘good’ or ‘bad’ in written English. There is only ‘ effective’ or ‘not so effective’ for the audience, communication function, situation, context etc. I recently read a fascinating book dealing with the gulf that exists between language prescriptivists and descriptivists. It’s called ‘You Are What You Speak: Grammar Grouches, Language Laws & the Power of Words’. It’s written by Robert Lane Greene, an American linguist, who is naturally in the descriptivist camp. Her gives a lot of background on Lowth, Defoe, Swift, Johnson and ‘that crowd’ (as Tom Lehrer would say). He also flatters Lynne Truss, the world’s best-selling punctuation nitpicker, by lumping her together with them. But his opinions of her ‘Eats, Shoots and Leaves’ book are not flattering. I agree with that view too. Thanks, Howard. I’ll definitely take a look at Greene’s book.